Enterprise Mobility Strategy – 7 Practical tips to start your journey today! Dan reports to Admin office and starts his work. He talks to mobile device again. Dan’s office receives information from Dan’s mobile device. Dan moves to next job, which was dispatched on his mobile device an hour ago. This is the future where enterprise mobility is heading. So, what should we do? Delay all decisions, wait everything to settle and then invest in mobility? Now is the time to plan and implement mobility. Businesses are under constant threat by global completion. We do not have a choice. Eventually businesses have to embrace mobility solutions. However, nature of business and business model would determine its urgency. 3. Start small: Start small with big picture in mind. Fund small projects and ideas within your business. Encourage staff to participate and share their experiences. Be Agile; incrementally roll out new mobility solutions. Iteratively improve existing solutions. 4. Think simple and smarter: To start mobile journey, we do not need big ERPs and expensive devices. Think how we can make next improvement. Do not find the silver bullet that will resolve all issues at once. Let me share an example with you. Consider field Technicians come to Admin office to pick-up their work-orders every day. At the end of day, they go back to Admin office to return completed work-orders and timesheets. Clearly, Technicians travel time is waste. Mobility solution can eliminate this waste. One of the easy way to do this is to handover Laptop and Printer to each Technician. Every working day, Technicians checks their email and print out work-orders from home. At the end of day, they scan back work-orders and timesheets to Admin office. This solution can be first step towards mobility. Later, business can develop Mobile App to records and share information. 5. Engage employees: Do not underestimate employees. They may already have prior mobility experience. Share information with them. Ask for solutions. Consult with them. 6. Focus on complete value-chain: In order to realise full potential of mobility, end-to-end value chain should improve. For example, if office staff lacks necessary tools for customer service and invoicing. Merely improving mobility will not make tangible difference in service. The capability should improve for all processes within value-chain. 7. Change Management: Adapting to mobility tools takes time. Employees may have to reprogram their brains. It can be a steep learning curve sometimes. It can be shift in business processes and culture. So, be patient and supportive in journey to enterprise mobility. Here is a question for you? 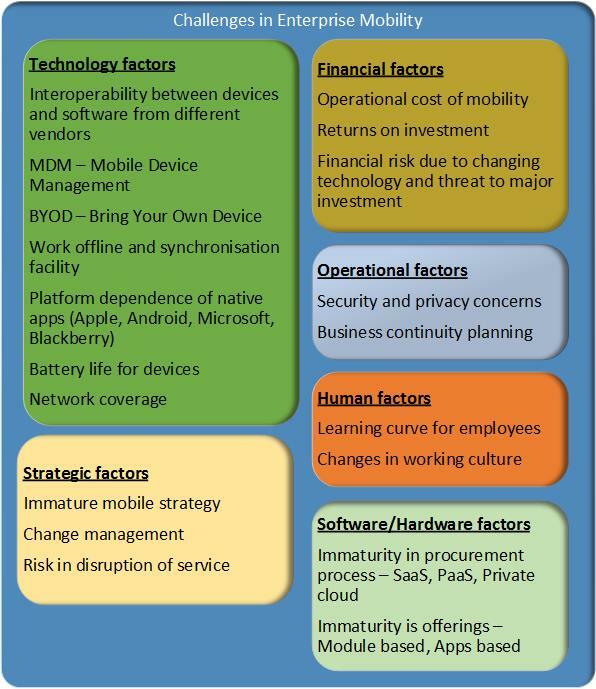 How you see opportunities/challenges that mobility will bring to your business? Are you ready to handle it? What are you doing today to ensure success for your enterprise mobility? If you like this post, please take 2 seconds of your time to share with your network.